Nail fungus is caused by a fungal infection in one or more of your fingernails or toenails. Usually nail fungus starts as a small white or yellowish dot underneath the very tip of your nail. The fungus will grow in from the outside, causing discoloration and brittle nails. Nail fungus can cause quite a bit of discomfort and pain as well as change the appearance of your nails. 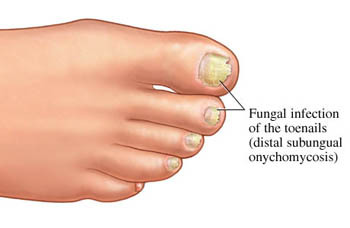 Nail fungus, also known as onychomycosis (tinea unguium), can be caused by a number of different types of fungus. Your nail fungus symptoms may be different depending on the type of fungus that has infected your nail. 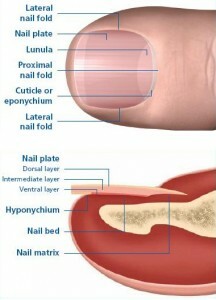 The most common symptom is a dark discoloration below the nail. This can be a yellowish color or sometimes almost green looking. Your nail will become thicker yet it will be much more brittle, making it easier to break causing ingrown nails. 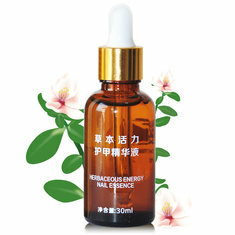 In some cases of nail fungus, the nail may even become completely dislodged from the nail bed. This condition, known as onycholysis, is somewhat rare and only exists in the most serious nail fungus cases. With onycholysis you may feel pain in the tips of your fingers or toes and may smell a foul odor coming from your nails. The types of fungus that attack nails are known as dermatophytes. It’s also possible for your nails to be infected by certain kinds of yeast and molds as well. Fungus is made up of many microscopic organisms that don’t need any light to survive. Some funguses have beneficial uses while other kinds are known for causing illness and disease. Fungus thrives in warm, moist environments like swimming pools, bath tubs and public showers. 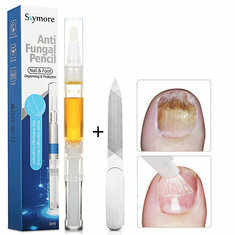 Fungus enters your skin through tiny cuts between the nail and the nail bed. These cuts may not even be visible to the naked eye. Once infected, if your nail is repeatedly exposed to warmth and moisture a fungal infection can take hold of your nail bed. Nail fungus is much more common in toe nails than finger nails. Toe nails are more likely to be exposed to warmth and moisture from the footwear we use. Tight shoes can also cause decreased blood circulation in your feet which can negatively impact your immune system’s response to the nail fungus. Growing older is the single biggest risk factor for developing nail fungus infections. With age comes a decrease in blood circulation in the body. Nails also grow more slowly and become thicker as we get older which can make them more susceptible to fungus. Nail fungus generally affects men more than women, especially men who have a family history of nail fungus. Other risk factors for nail fungus include heavy perspiration (especially feet), working in a humid environment, improper footwear and even diabetes. Diabetes can cause circulation problems as well as a weakened immune system. Walking barefoot in public places that are damp like a public shower or pool can also lead to a nail fungus infection. Not only can nail fungus be painful, but it can also cause permanent, irreversible damage to your nails if not treated properly. It can even lead to more serious infections in other parts of the body, not just your feet. This is more likely in people who have a weakened immune system from diabetes, medication other another medical condition. If you suspect you have nail fungus it’s important to consult with a physician. 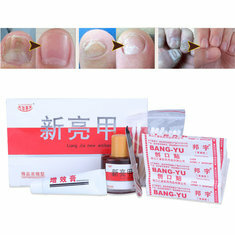 A doctor can test to see whether or not you have nail fungus by taking a sample from below your nail to be analyzed. Learn how to natural cure nail fungus and how to have healthy nails again. Other skin conditions like psoriasis can actually cause the same symptoms as nail fungus, so it’s important to determine the actual cause in order to find the most effective toenail fungus treatment.